ETH researchers studying yeast cells have discovered a new mechanism for detecting foreign genetic material from pathogens or environmental contamination, and rendering it harmless. Over the course of their long history, bacteria have developed an effective immune system to detect and fend off intruding genetic material from viruses or competing bacteria. One element of this "innate" immune defence in single-cell organisms is the CRISPR-Cas system, which stores genetic material from intruders to recognise pathogens and fight them off in the event of a subsequent infection. 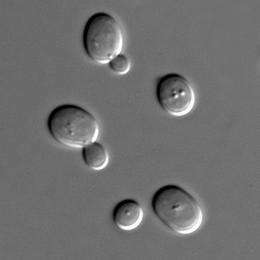 Now a team of researchers led by Yves Barral, Professor for Biochemistry at ETH Zurich, have found what they were looking for in yeast cells. These unicellular fungi, they discovered, feature a hitherto unknown defence mechanism located at a surprising spot within the cell: the chromosomes' centromere. The scientists have published their findings in the latest issue of the journal Cell. In contrast, foreign genetic material—such as the virus-like DNA or DNA circles that enter a cell from time to time, or chromosomes without a centromere—cannot condense. As a result, no kinetochore can assemble and hence there is no attachment site for spindle fibres.